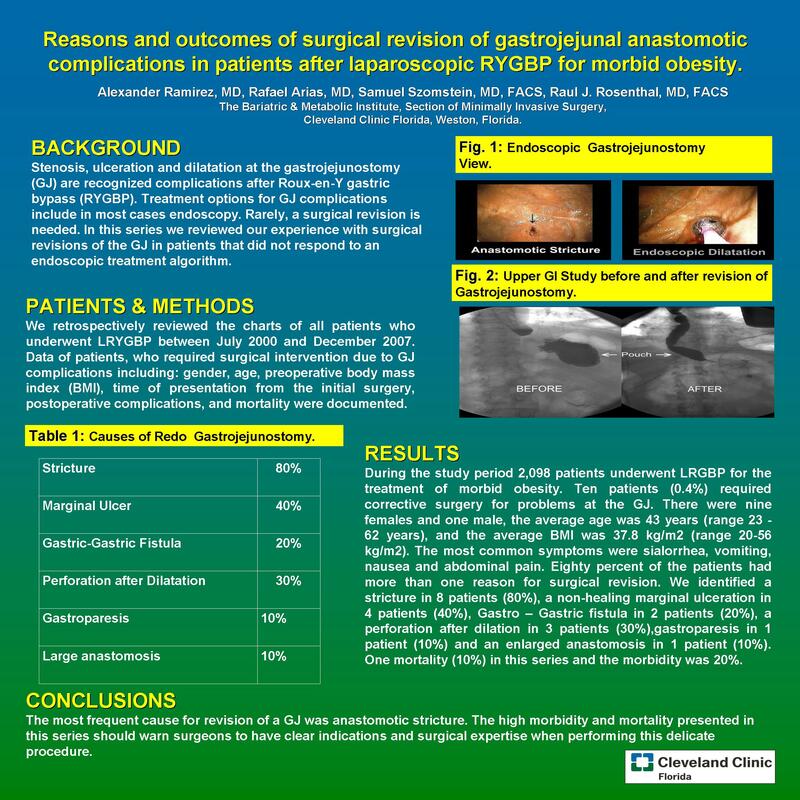 Reasons and Outcomes of Surgical Revision of Gastrojejunal Anastomotic Complications in Patients After Laparoscopic Rygbp for Morbid Obesity. Stenosis, ulceration and dilatation at the gastrojejunostomy (GJ) are recognized complications after Roux-en-Y gastric bypass (RYGBP). Treatment options for GJ complications include in most cases endoscopy; rarely, a surgical revision is needed. In this series we reviewed our experience with surgical revisions of the GJ in patients that did not respond to an endoscopic treatment algorithm. After IRB approval, we retrospectively reviewed the charts of all patients who underwent LRYGBP between July 2000 and December 2007. Data of patients, who required surgical intervention due to GJ complications including: gender, age, preoperative body mass index (BMI), time of presentation from the initial surgery, postoperative complications, and mortality were documented. During the study period 2,098 patients underwent LRGBP for the treatment of morbid obesity. Ten patients (0.4%) required corrective surgery for problems at the GJ. There were nine females and one male, the average age was 43 years (range 23 – 62 years), and the average BMI was 37.8 kg/m2 (range 20-56 kg/m2). The most common symptoms were sialorrhea, vomiting, nausea and abdominal pain. Eighty percent of the patients had more than one reason for surgical revision. We identified a stricture in 8 patients (80%), a non-healing marginal ulceration in 4 patients (40%), Gastro – Gastric fistula in 2 patients (20%), a perforation after dilation in 3 patients (30%), gastroparesis in 1 patient (10%) and an enlarged anastomosis in 1 patient (10%). In this series, one mortality (10%) was found and the morbidity was 20%. The most frequent cause for revision of a GJ was anastomotic stricture. The high morbidity and mortality presented in this series should warn surgeons to have clear indications and surgical expertise when performing this delicate procedure.